This year, I felt the Lord wanted me to prophesy regarding the new beginnings in 2019 for the global Church. I have some words concerning the president and some nations, etc., but I am also leaving that to some of my prophet friends – like Lance Wallnau who has the Word of the Lord for the US president. • This year the light, glory and power of the Kingdom of God are arising like a great tsunami, marked by miracles and extremely accurate prophecies, like never before. • God wants us to really know what era we are in and stop looking back at the old moves of God. It’s not in the First Reformation, nor the 1000-year Dark Age, nor the Second Reformation of the Church. We are in the Third Reformation where the finalizing of all things will take place. We have to catch up our theology to fit into the time of the Lord and be “established in the present truth” or we will not fulfill our role in this season (2 Peter 1:12; 1 Thessalonians 5:1-6; Ephesians 1:10). • From now on, prophets who go to the nations will not just prophecy information but release a word that causes nations to become either sheep nations or goat nations, depending on their response. This is in preparation for Jesus, the Mighty Man of War, to come back and judge the nations according to Matthew 25:31 and Revelation 21:24. • This year we have won a victory, so like David after Ziklag, we are receiving the same word of the Lord that David then received. In other words, this is the action we, the Church, are to take against our spiritual enemy—ATTACK, TAKE BACK, AND RECOVER ALL (1 Samuel 30:8; 17-20)! • We are in “Level 3” of overcoming. We have been overcoming by (1) the Blood of the Lamb, (2) the word of our testimony, and now we must (3) love not our lives unto death. That means complete death to self, life in the spirit, and conformity to the character of Christ (Revelation 12:11; Galatians 2:20; 2 Corinthians 4:10-11). • In 2019, we have already entered the second wave of the prophetic, which means we are commanded to prophesy again until resurrection life is activated. Don’t wait. Prophesy to the issue you already heard the Lord on, and see yourself rise up along with the global Church as an exceeding great army (Ezekiel 37:10). • In 2019, the Holy Spirit is beginning an intensified work to purify and perfect us to Christ’s likeness and maturity. The final and most important thing to know is this: God’s highest calling and purpose for every saint and minister is for them to be conformed to the likeness of Jesus Christ. This is why it is intense. Our responsibility is to choose to be conformed. 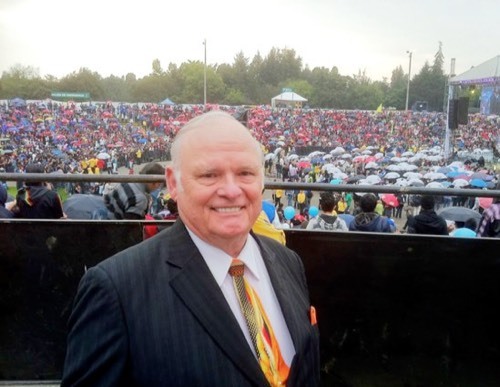 Dr. Bill Hamon is the founder of Christian International Ministries, a premier prophetic ministry for over 45 years. A prophet for 60 years, he has prophesied to more than 50,000 people and provided training for over 250,000 in prophetic ministry. He has authored nine major books, specializing in the restoration of the Church and what to expect next on God’s agenda. Dr. Bill Hamon is respected by church leaders around the world as a senior leader of the prophetic/apostolic company God is raising up in these last days. He serves as bishop to over 3,000 ministers and churches and CI’s headquarters on five continents. Bill resides in Santa Rosa Beach, Florida, along with his three children, eleven grandchildren, and sixteen great-grandchildren. “Mom” Hamon’s legacy lives on through their family and the work that continues at Christian International Ministries. This topic was modified 3 months ago by Ron McGatlin.